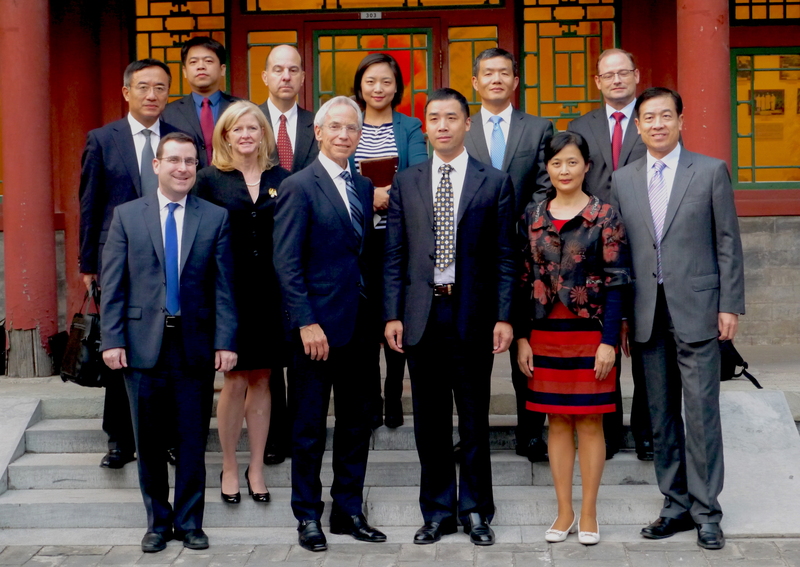 Mr Donald J Rosenberg, Executive Vice President and General Counsel of Qualcomm Inc., visited the Peking University Law School (“PKULS”) in the afternoon on October 15, 2015. PKULS Vice Dean Professor Xue Jun, Intellectual Property Law Professor Zhang Ping, Intellectual Property Law Professor Yang Ming, and Assistant Dean and Director of External Affairs Office Dr Li Yuanyuan attended the meeting. Vice Dean Xue on behalf of PKULS welcomed the Qualcomm delegation and thanked them for visiting the School. He briefed them on the recent developments of PKULS and welcomed any future opportunities for strengthening the relationship between Qualcomm and PKULS. Mr Rosenberg thanked Vice Dean Xue and PKULS for the warm reception of the Qualcomm delegation. He pointed out that in this technology-dominated era, increasing the understanding of national development policies for various industries as well as anti-trust laws of different countries is of prime importance. In this regard, Qualcomm is looking to Peking University for its reputable academic expertise in these areas, and hopes to work closely with PKULS to address any related issues and concerns. After the meeting, Mr Rosenberg delivered a lecture titled “Innovation Driven Development & IP Protection” at the Koguan Building Lecture Theatre. Afterwards, he exchanged dialogues with participating academics and students.